WEI oh WEI are our our work computers so rubbish? 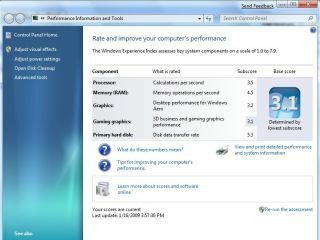 Microsoft has made several changes to its Windows Experience Index for Windows 7 and it's been explaining the alterations to the computer 'scoring' system on its official blog. The Windows Experience Index has proved to be a popular addition to the operating system, grading PCs on a number of criteria that include processor type and speed, RAM, graphics grunt for both gaming and normal use, and the size of the primary hard disk. "We do want to caution folks in trying to generalise an 'absolute' WEI as necessary for a given individual," comments Microsoft's Steven Sinofsky in the Engineering Windows blog post. "We each have different tolerances or, more importantly, expectations for how a PC should perform and the same WEI might mean very different things to different individuals." One of the key changes has been moving the upper limit of the score from 5.9 to 7.9, but the WEI team has also used feedback to make the rating "more indicative of actual use". "These new levels were designed to capture the rather substantial improvements we are seeing in key technologies as they enter the mainstream, such as solid state disks, multi-core processors, and higher end graphics adapters," explains Michael Fortin. "Additionally, the amount of memory in a system is a determining factor." It's no surprise that one of the areas that sees the biggest breadth of performance is in terms of graphics – machines range between gaming rigs with dedicated dual SLI cards and laptops without dedicated graphics cards – but Fortin has added criteria to the higher levels that should give users a better idea of what the score actually represents. "For these new levels, we're working to add guidelines for each level. As an example for gaming users, we expect systems with gaming graphics scores in the 6.0 to 6.9 range to support DX10 graphics and deliver good frames rates at typical screen resolutions (like 40-50 frames per second at 1280x1024). "In the range of 7.0 to 7.9, we would expect higher frame rates at even higher screen resolutions. Obviously, the specifics of each game have much to do with this and the WEI scores are also meant to help game developers decide how best to scale their experience on a given system. "Graphics is an area where there is both the widest variety of scores readily available in hardware and also the widest breadth of expectations." Fortin's lengthy post also deals with disk drive performance, how multiprocessor cores are rated and several other areas – so if you're interested in how your computer gets that 3.3 in WEI for Windows 7, the post is well worth a read.